If you’re looking for a way to get rid of that old mattress or couch, the city of Frederick may have a solution for you. The city has a new plan to help people who have no way of getting large, unwanted items to its next Freecycle Roundup bulk item drop-off event. Employees of Frederick Community Action Agency’s Green Jobs program have agreed to help out. The employees will drive around during the next Freecycle Roundup event in April to pick up items from people who preregister for the service, said Nikki Bamonti, executive assistant to Mayor Randy McClement. “If it works out, it solves every problem we have had with this event,” McClement said. 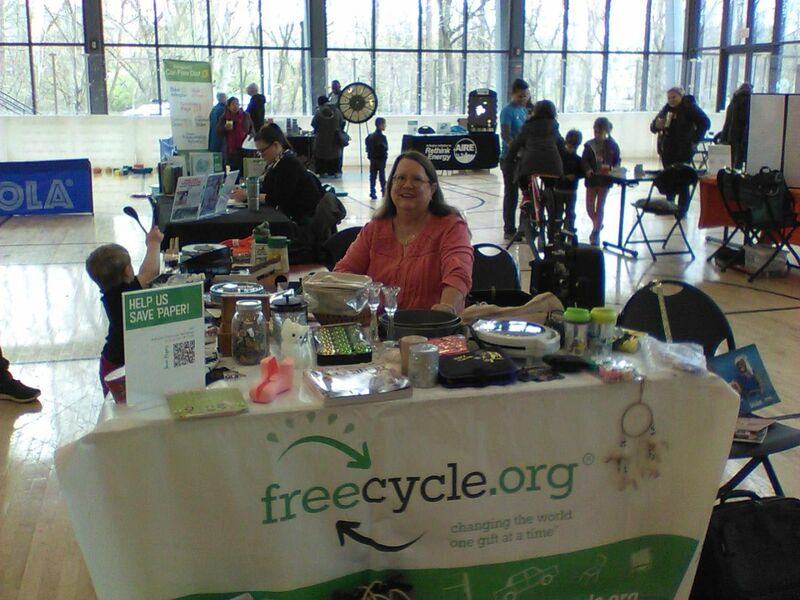 The next Freecycle Roundup event will be from 8 a.m. to 2 p.m. April 11 at Walnut Ridge Park, 1151 Rocky Springs Road. City residents are asked to bring their unwanted bulk items to the park, and nonprofits will be waiting to sort through donated items to see if they can be repurposed. If you didn’t get a chance the first time, another Freecycle Roundup event is being held on October 4, 2014. Frederick City residents will have the opportunity to dispose of their large bulky items they no longer need. Officials will stage the Roundup at 531 Highland Street, known as Area K.
A national museum recycling network, Museum Freecycle UK, was launched today to encourage the recycling and reuse of exhibition build elements between museums by Urban Salon and the Freecycle Network. The launch coincides with UK Recycle Week. Museum Freecycle UK is the first industry-wide and national Freecycle network created since Freecycle was founded in Tucson, Arizona in 2003. The idea was floated in an article by Alex Mowat, Creative Director of Urban Salon in Design Week two weeks ago and received such a positive response, that Urban Salon went on to work with the Freecycle Network to set up the online portal. The group is being run by Urban Salon with the support of SHARE Museums East and The Collections Trust. Royston Freecycle group will launch the café as it celebrates its 10th year of keeping old items in use in the town. Volunteer repairers will be helping people to mend broken items at a free event at The Meridian School, in Garden Walk, on Sunday, February 9. Anyone with something that needs mending – bikes, toys, clothes, tools, small items of furniture, electrical equipment including IT hardware – can bring their item to Meridian School between 10am-3pm. The broken item will be assessed and, if it can be mended immediately, the owner will be shown how to do it. If the repair is more major, organisers will refer people to local professional repairers. For local updates and other information about repair and re-use go to www.facebook.com/RoystonRepairCafe or call Chris Lee on 07962 157589. My name is Ben Harrison, I am a 22 year old Worcestershire based Landscaper, offering design and build services. I produce detailed designs to suit style, build cost and material preferences. I have a keen interest in upcyling existing materials and products; helping me create unique spaces in unlikely locations. This garden will be designed making use of Freecycle and all other freely available recycled items that you would typically see in your kitchen. Sinks have become planters, tea cups and jars grow herbs and kitchen cabinets frame cleverly grown vegetables. Celebrate Earth Day from 10 a.m. – 2 p.m. Monday, April 22 in the Oak Grove by participating in Freecycle. This is a community effort designed to keep useful items out of the trash by giving said items away to be put to good use. Freecycle @ SF welcomes the donation of small personal items in good condition including clothing, shoes, accessories, housewares, linens, craft supplies and home décor items. Items remaining at the end of the day will be donated to The Repurpose Project located in downtown Gainesville or Saints Shareware located in HA-130. This event is sponsored by the Office of Civic Engagement & Service and open to the public.